Anxiety includes common feelings of worry or fear. It usually ends when the situation that caused it is over. However, when these feelings become extremely out of proportion or constant, it may be severe. Physical and emotional symptoms may occur. Physical signs include heart palpitations, nausea, chest pain, shortness of breath, stomach aches, or headache. While emotional feelings of restlessness, inability to concentrate, endless fear, or irritability may occur. Getting help early gives you the best chance for recovery. Therapy can help you recognize and accept your anxiety about specific fears or situations. Our staff will help you by looking at your worries more thoroughly while changing the thoughts, behaviors, and patterns that lead to troublesome feelings. Call our office to schedule an appointment. 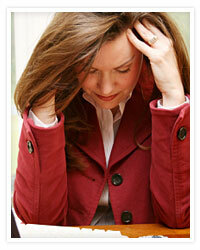 Medication is often required to help alleviate the symptoms of anxiety. Often, the most effective approach to treat anxiety is the combination of therapy and medication. Our staff CRNP will work with you to determine whether or not you would benefit from medication, and what medication would best suit your needs.